Perry Hall Children’s Center is excited to have a tree at Kennedy Krieger Institute’s Festival of Trees this year! All of our students made ornaments for the tree. Each class made a different ornament to the theme of our saying- “We Paint All Our Days Sunny”. We are SO thrilled with our final creation and hope you are too. If you have time this coming weekend please stop by Festival of Trees, take a selfie with our tree and post it to our Facebook page! 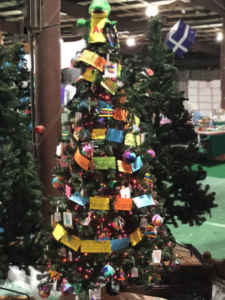 Info for Festival of Trees can be found here . Also, we are in the running for their social media contest. Please share and vote for us here !! !